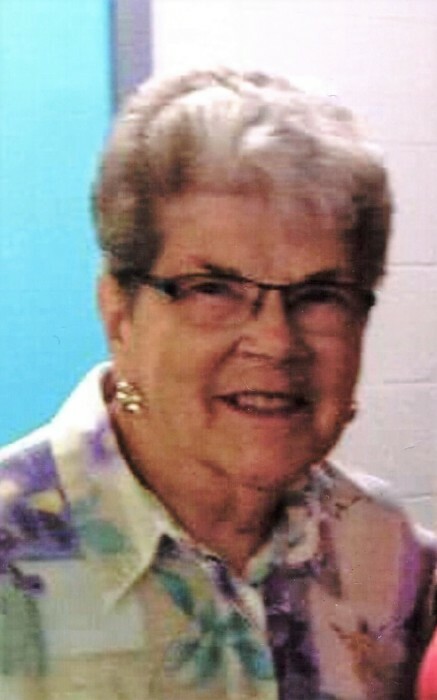 Delores Evelyn (Hesler) Robbins, 87 of Bloomington went to be with her Lord and Savior, Jesus Christ, on Friday, July 13, 2018 at Hearthstone Health Campus. Born January 25, 1931 in Monroe County, she was the daughter of William “Frank” and Shirley (Allen) McConnell Hesler. She married William Kenneth “Bill” Robbins on November 23, 1949. Delores retired from RCA in 1986. After she retired she started a new career selling Electrolux vacuums because of her love of people. She attended the Harrodsburg Assembly of God. Survivors include her son, Gregory Robbins of Denver, Co.; daughters, Shirley Jones and husband Charlie of Bloomington and Debra Blasdel of Bloomington; grandchildren, Heather Galm of Ellettsville, Tyler Landis of Worthington and Sarah Stancombe and husband Steven of Bloomington; and great-grandchildren, Briana and Kelsey Lavender. She was preceded in death by her husband of 65 years, Bill; by her parents; brothers, William E. Hesler and Ervin “Mac” McConnell; and her son-in-law, James “Jim” O’Malley. Funeral services will be held at Chandler Funeral Home in Ellettsville on Wednesday, July 18, 2018 at 1:00 p.m. with Pastor Mike Winters officiating. Burial is to follow at Clover Hill Cemetery in Harrodsburg. Visitation will be at the funeral home on Wednesday from 11:00 a.m. until time of services.